Al Featherston passed on today, Monday, 11-5-2018. My longtime friend, Al Featherston died Monday, Nov. 5th, 2018 at Duke Hospital after a long illness. Many of you know that Al has been a sportswriter for more than five decades and has authored books on both history and ACC sports. Al attended Duke University and contributed to the ACC Sports Journal, Basketball Times, Blue Ribbon Yearbooks, Duke Basketball Report, GoDuke.com and many other outlets over the years. He spent a great portion of his career writing for the Durham Morning Herald and the Durham Herald Sun as well. He battled his illness until the end, but never recovered well from elective heart surgery. He was also diagnosed with ALS or Lou Gehrig's disease. Being a long time New York Yankees fanatic, Al was able to go out like one of his favorites. Towards the end, another good friend of Al's named Ed McIntyre was able to help get our pal into a retirement home. I would take Al to appointments and run errands while going over on Saturdays to watch college football games. We thought we'd lost Al about two weeks ago, On a Monday, following the win over Georgia Tech, Al went back into the hospital never to come out, He would also lose conscience for about five days. Thankfully, Al came out of that and just in time to inform his sister Libby who was up from Southport on his final wishes. He was able to get some closure and I can tell you after conversing with him that he was still very sharp minded and at peace with what was to come. So, as soon as I get to his room, Al spots the box score to the Duke Basketball exhibition game in my hand. Before he can say hello, he is reaching for it while asking me about Marques Bolden. Yep, his faculties were intact and he wasted little time in wanting to talk about that game and the Duke loss to Pitt in football which he had just watched. I spent the better part of three hours with Al the last time I saw him. I filled him in on what he missed while being out and he sponged it all in while wanting to continue to talk about this years basketball team. Al was very excited about tomorrows Duke matchup with Kentucky and the Duke-UNC football game coming up this weekend. He mentioned that he was sad that he would miss this basketball season with this year's talented team, but we had all hoped he could bounce out of his issues and at least make it through this week. I was saddened to hear the news of his moving on from his sister this morning whom I have been able to get to know through the process. 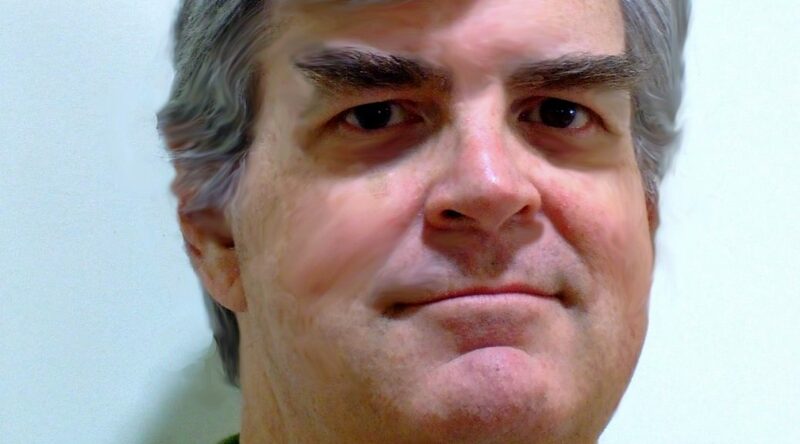 I contracted a virus and could not make it back to see Al beyond that last conversation. But in the end, I realized I had a great conversation with him that day and it was a normal exchange which I think he liked. I will miss my friend greatly and talking Duke Athletics, ACC sports in general and appreciate the many memories with him by my side. Al wanted his sportswriter friends and acquaintances to know he was thinking about them. He was in his favorite spot in the world on press row where he enjoyed socializing. Towards the end, the plan was for him to dictate some messages to me but time would not allow for that. But, again, he was thinking of many of you. Whether you are a sportswriter, work at Duke Athletics or in the ACC offices in Greensboro, just know Al was appreciative of the relationships. Al was the son of Louis Alywn Featherston Sr. and Mary Norfleet Vick Featherston. He is survived by his sister, Elizabeth "Libby" Featherston if Southport, N.C.; and brothers, Mark Featherston of Caddilac, MI and Richard Featherston of Seymour, Conn. The family plans a private cremation. A celebration of Al's life will be announced at a future time. I will let you know of any further details and please pass this information on. I appreciate your friendship Al, who last told me he was looking forward to seeing what happens next. The Duke Blue Devils are off to a 3-0 start this season with cross-town rival North Carolina Central next on their schedule. 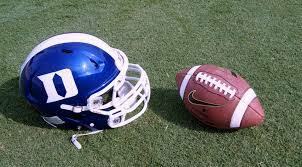 Duke will take on the Eagles on Brooks Field in Wallace Wade Stadium in a game which kicks off at 3:30. The contest can be seen on the ACC Network. The Atlantic Coast Conference announced today that the kickoff time for the Virginia Tech at Duke game on September 29th will get a prime time 7:00 start. That game will be on either ESPN 2 or ESPNU. Both teams could come into the game undefeated if they get by this week's opponents. Dylan Singleton and Jack Wolabaugh earned ACC Player of the Week honors this week. Making his first career start in Saturday’s 40-27 win at Baylor, Wohlabaugh posted a team-best offensive line grade, along with four knockdown blocks. He spearheaded a Duke offense that yielded zero sacks, committed zero penalties and suffered zero turnovers. Wohlabaugh provided protection for quarterback Quentin Harris, who in his first career start threw three touchdown passes with no interceptions. Singleton carded seven tackles, caused one fumble, recovered another and broke up a pass in the Blue Devils’ win at Baylor. His fumble recovery midway through the first quarter set up Duke’s first touchdown. Singleton led the Duke defense, which shut out Baylor in the first half en route to building a 23-0 lead at intermission. The Blue Devils may rest a lot of players in this weeks game. 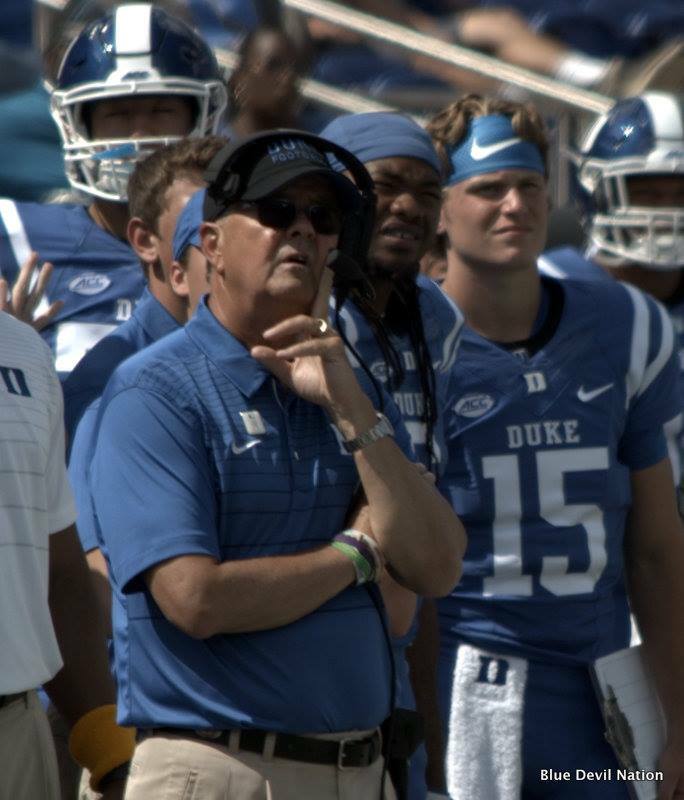 Starting quarterback Daniel Jones is sure to be out. Center Zach Harmon was available this past Saturday but did not play. Defensive End, Terrell Lucas will likely miss another game. Mark Gilbert is of course, out for the season and Jeremy McDuffie and Aaron Young are day to day. Christian Harris and Rak Chambers also missed some game time at Baylor on the offensive front and their injuries are unknown at this time. The Blue Devils win got them some vote in the new Top 25 polls. Duke is 28th in the A.P. and 27th in the Coaches Poll. Closing thoughts - Duke is riding high after a 3-0 start and they should be. However, injuries are stacking up. Thankfully, we are seeing that Duke has more depth than in the past which has offset that to date. Some old demons reared their ugly head when Duke had a punt blocked which gave up some momentum and a touchdown in the win over Baylor. Duke also had a botched XP. It is something to keep an eye on in the weeks to come. The stat of the wee was no penalties. That does not happen very often and it can mean the difference in games. It made up for the blocked punt. It has to feel good for the Duke staff to have two power five conference road wins in their first three games. After all, only Duke Football can claim that feat. The Blue Devils have started the last two season 3-0. The Duke Blue Devils pushed their season record to 3-0 with a 40-27 victory over Baylor which falls to 2-1. The Blue Devils won their second consecutive road win against two power-five conference teams, something few teams have done in the early season. Despite being down six starters, the Blue Devils found a way to win via the play of some backups. Quentin Harris is now 1-0 as a starter at Duke where he settled into the game nicely after a sluggish start. Harris was 12-30 for 174 yards and 3 touchdowns in the air and added 83 yards on the ground. 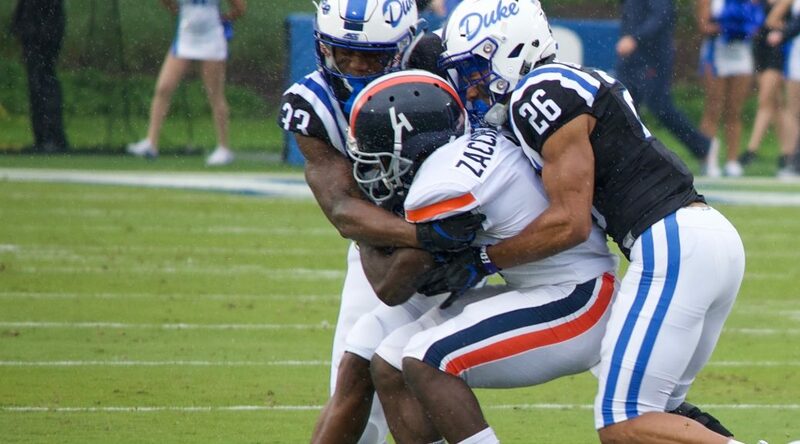 Duke will certainly reap the rewards from Harris gaining valuable experience in Daniel Jones absence. Harris will also start next week for Duke who will take on N.C. Central in their homecoming game. Harris connected on passes of 7 and 28 yards to T.J. Rahming and added a 66-yard toss to Jeremy Lloyd in his teams win. The Blue Devils offense produced 225 yards on the ground where Deon Jackson led the way with 83 yards. Brittain Brown added 53 yards for Duke. 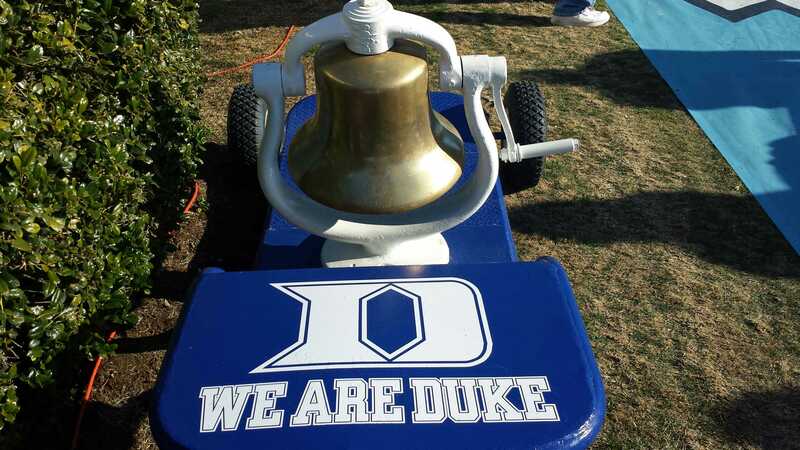 Jackon put Duke on the board with a 33-yard scamper to the end zone and the Blue Devils would jump out to a 23-0 lead. That lead seemed to run a lot of Baylor students from behind the Duke bench once the second half started. The Duke defense had some big plays of their own. Leonard Johnson intercepted the ball and took it back 53 yards for a score. That gave Duke a 40-20 lead. Duke was also aided by a forced fumble from freshman Josh Blackwell where Dylan Singleton picked it up. Duke held the Baylor team in check for most of the game but their potent passing attack would ultimately lead to 270 passing yards, much of that coming late. Considering the Blue Devils were down three key defensive starters in the secondary, the number of yards should be no surprise. The defense also bottled-up the Baylor running backs all day long but allowed some yard to the quarterbacks. The Bears keep you off balance with their two-quarterback attack. This was an impressive win for the Blue Devils where they were considered the underdog on the road for the second consecutive week. 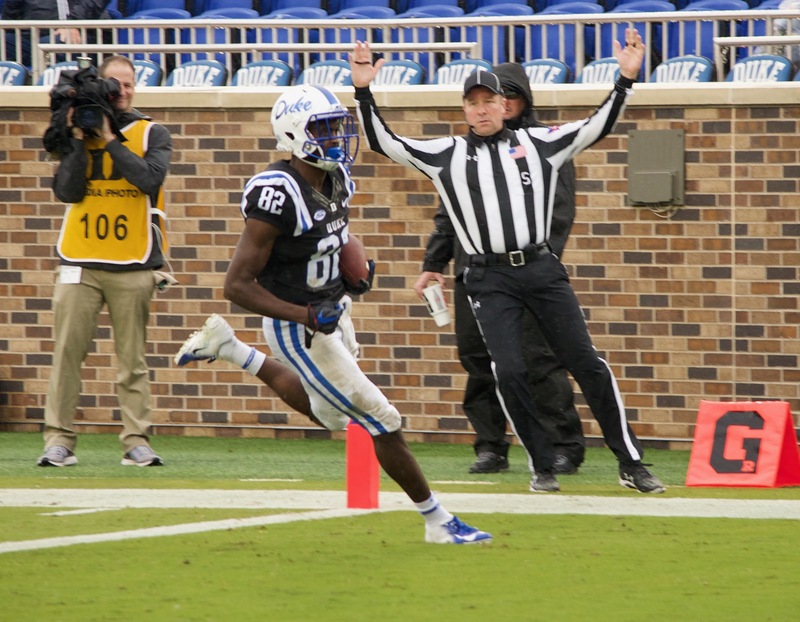 Duke did not commit a penalty in the game and they fended off difficulty with travel logistics due to Tropical Storm Florence. The wait is finally over. 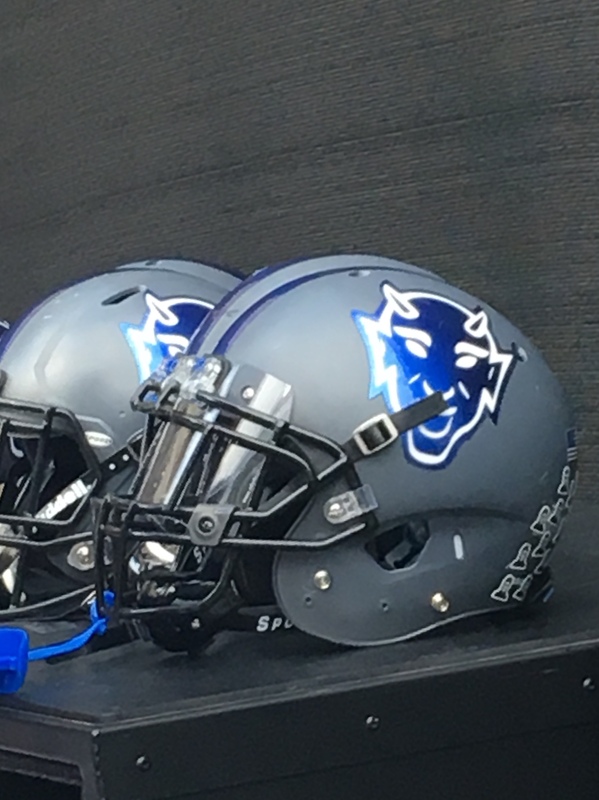 After a long offseason, the Duke Blue Devils are set to take to Brooks Field in Wallace Wade Stadium to take on Army this Friday night. 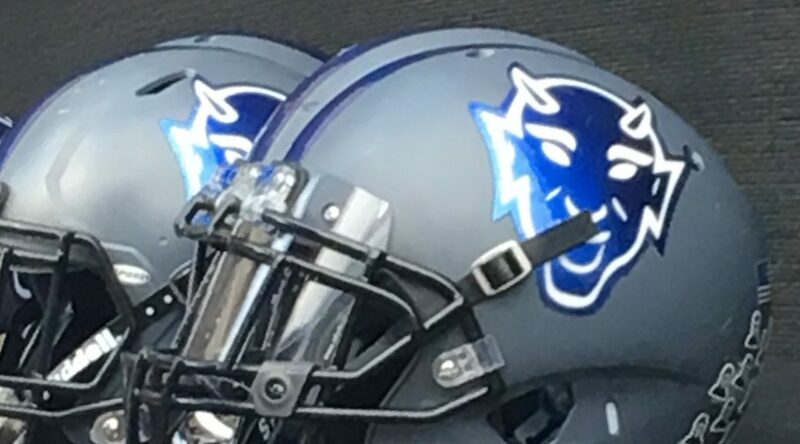 Blue Devil Nation will address what we feel are the key factors in the contest while also giving you an idea of what to expect this season via changes in the depth chart. A season ago, Army defeated the Blue Devils on a cold and windy day at West Point by a 21-16 score. In fact, that was the last time the program has lost and was just four games ago. The Army defense tallied three key sacks on Daniel Jones. The Cadets also blocked a punt for a score and that was the difference. The Army had a stellar season a year ago winning a bowl game on their way to a recently historic finish. Army head coach Jeff Monkan has rebuilt the program which remains on a solid foundation. The strength of this years team will be their defense which returns 8 starters from a season ago. It is also worth noting that Army has held Duke to just 29 points in the last two seasons. Their top players on the defensive side of the ball are DL Kenneth Brinson, LB Cole Christensen, DB Gibby Gibson leading a veteran unit. The offense will be breaking in 8 new starters but is anchored by a solid center in Bryce Holland and running backs Darnell Woolfork and Kell Walken. Here is a quick look at the changes for Duke Football going into the game. Robert Kraeleng earned the LT spot and will Christian Harris mans the RT spot. 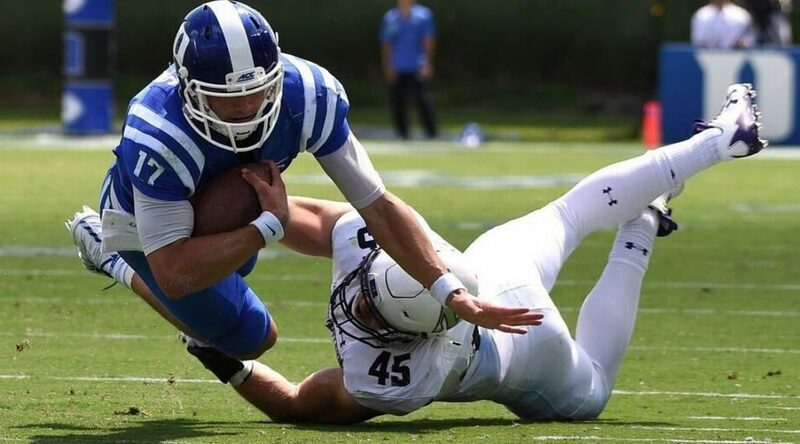 Duke has settled on young backups in true freshman Casey Holmon and soph Jayson Miller. There are two other true freshmen to watch out for on offense in WR, Jake Bobo and RB Mario Durant. Ideally, redshirts would be in order, but both of these kids have made it hard to sit them in the preseason. Derrick Tangelo has beaten out Trevor McSwain on the DL, for now, Drew Jordan gets the nod over Tre Hornbuckle at the DE spot. Duke will play a lot of players up front. Josh Blackwell has earned the starting spot at CB to go with returning starter and standout Mark Gilbert. Marquis Waters earned the starting job at one safety. The first and most important is to keep Daniel Jones upright. Teams will attack Duke on the corner of their offensive line and three Army sacks a year ago killed momentum. The second and equally important factor is to get off to a good start. Army is big on momentum. A few years back they scored early on a Sean Renfree miscue and handled Duke in Wade. The Cadets are not built for a comeback, so a couple of early scores could help Duke to the win. Limit big plays is always a factor for Duke. Army will not pass much, but when they do (maybe three times) they can go for big plays. Duke must also play tight on special teams, namely in the punting game. Pardon me while I grab the crystal ball and polish it off for a view. I think Duke will score early and never look back. I would think that the Duke defensive front and linebackers should handle an inexperienced Army offensive line and maybe cause a turnover for a score. In fact, if there are no breakdowns, I think Army will be held to a single score. The Duke offense will not show all their tricks with really tough road games with Northwestern and Baylor ahead, but I think we will see a crisp effort on most downs. If Duke stays within the scheme on defense, matches the Army's physicality, and stays focussed, I see a nice result. Duke has won just one time on Friday night way back in 1954 over SMU and they stand 1-4 overall. Mike Krzyzewski is a 1969 graduate from Army. In his pre-Canadian tour, he expected a Duke win over his former school. 21 power 5 schools have two bowl wins in their last three season and that list includes the Blue Devils.